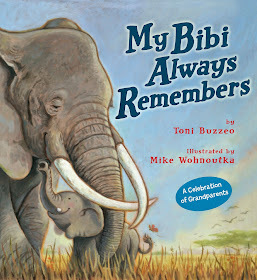 Noodling with Words: MY BIBI ALWAYS REMEMBERS - SIGNED COPY GIVEAWAY! 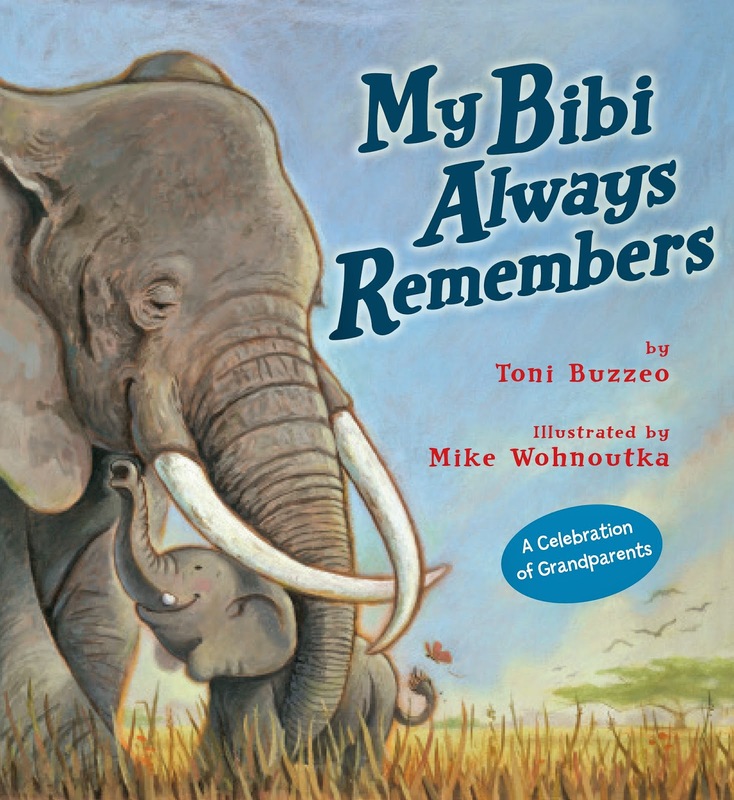 MY BIBI ALWAYS REMEMBERS - SIGNED COPY GIVEAWAY! I have a special treat for you today in honor of National Grandparents Day! And if you know me at all, you'd probably guess that I'd be celebrating with a book. And you'd be right. In this case, a new book from the awesome author and illustrator team of Toni Buzzeo and Mike Wohnoutka. Regular blog followers of mine may remember that I reviewed the last offering by this team, JUST LIKE MY PAPA last September. Perfect Picture Book Friday posts don't start up from the summer hiatus until next week, so I'm jumping the gun a bit but I wanted readers to know about this new book if you want to find the perfect book for kids to share with their grandparents this weekend in honor of the holiday. Or any weekend. Shouldn't we celebrate grandparents all year long? Yep. Thirsty little Tembo hears her Bibi across the wide, parched plain. Synopsis: An easily distracted young elephant follows the herd as it searches for water. The oldest grandmother elephant carries the knowledge and skill to lead "the way to wet." Note: This is a Disney book, so I felt a Bambi-like moment of terror when Tembo wanders away and the illustration appears backlit by the setting sun with lions and hyenas in the foreground! Luckily, the problem resolves on the next page. Whew! The combination of anthropomorphism and reality worked well for me. Activities/Resources: Ms. Buzzeo provides extensive materials to accompany her books. You can find Common Core teaching guides and activities , including a cool Reader's Theater Script on her website. If you want to learn more about the plight of elephants in the wild, back matter in the book steers readers to the Amboseli Trust for Elephants at www.elephanttrust.org. General information about elephants can be found in many places including National Geographic's website and the kid-friendly Animal Fact Guide. There are an equally large number of elephant craft choices out there. The paper plate elephant contributed by Leanne Guenther to DLTK's Crafts for Kids blog made me smile. Enter to win a signed copy of this book by leaving a comment for me! One name will be drawn randomly from all commenters at noon on Tuesday September 9th. I'll announce the winner later that day. And FINALLY, since I started this post talking about the link to National Grandparents Day, download a completely adorable card to make for grandparents from the author's website here. Just download and fold! Remember to leave a comment to enter the giveaway! As a disclosure, an early advance copy of this book was provided by the publisher in exchange for my review. This looks like a perfect story with heart and hope and tenderness that is so much in need for so many children. Thanks Wendy for this review. This is the third great book by this duo. Sounds like a lovely story. I always forget Grandparents day, because every day is grandparents day! I'm going to see if my library has this one. I love elephants. The book just came out this week. If they don't have it yet, maybe soon! Or maybe you'll win a copy. What a great gift for Grandparent's Day! I will have to get it for my mom! Thanks for a great post, Wendy! Thanks, Elaine. Best of all, you don't have to wait for the book to download the card from Toni's website and have it ready for tomorrow! I LOVE Toni's books. JUST LIKE MY PAPA is a favorite around here along with ONE COOL FRIEND. She is so talented. Mike Wohnoutka is from MN, and I didn't know about this book yet. So glad that you wrote about it. I also love elephants, and I'm working on a grandparents book myself. So I can't wait to read this one. Sounds like this book is perfect for you, Sharalyn! What a beautifully illustrated book! Who doesn't love elephants? They're fascinating and complicated. So great that your family support the TN elephant sanctuary. Thanks for the giveaway, Wendy! The Sanctuary took Dulary, one of the elephants from the Philadelphia Zoo when it decided it was too small to continue to keep these huge beasts. Sadly, Dulary passed away earlier this year but she had 7 years of relative freedom in TN. I love elephants, Wendy, and I'm a big Mike Wohnoutka fan, so I'd love to read this book and see the illustrations and share it with my granddaughters - it looks wonderful! Thanks for sharing! Wendy, I can't wait to read this book. (I just recently read "Little Loon and Papa.) I loved reading the back story and the other goodies the author provided with the book. This looks like a great book! Thanks for pointing it out Wendy! My pleasure, Meg! There are SO MANY good ones, it's easy to miss one. Thanks, Wendy for the review. I look forward to reading this one. Love how many facts you can learn about elephants alongside a great story! Exactly! Learning without knowing or feeling that you are, just swept away in the story. This sounds like a wonderful book and I'd love to win it for my niece. Thanks. I'll draw the winner at noon today (actually randomizer will :) ) Good luck! That is "one cool grandma" story. Thanks for the review, Wendy.